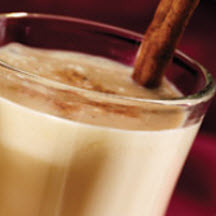 Traditional holiday eggnog and wassail come together to create a festive new holiday beverage. Combine eggnog, cider and spices in a large pot. Heat on low, stirring occasionally. Remove cloves and pour into glasses. Can be served warm or cold.